Explosive experts have been helping miners get close to where a toddler who fell in a well on 13 January in southern Spain is trapped, keeping the country on tenterhooks with a rescue operation fraught with glitches. Rescuers have been working round-the-clock under the media glare to try and reach two-year-old Julen Rosello, whose parents say fell down a narrow shaft as he was playing in Totalan, a town near Malaga. There has been no sign of life from the boy but rescuers think they know where he is inside the illegal well which is more than 100 metres deep. 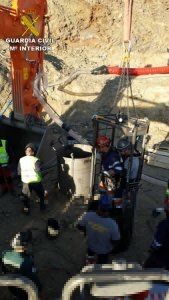 On Friday, miners were deep underground in a specially-excavated shaft parallel to the well, painstakingly digging a four-metre tunnel to join both channels and hopefully reach Julen with the help of small, controlled explosions. Jorge Martin, a spokesman for the Guardia Civil police force, told reporters they were also having to extract ‘the contaminated air and gases that are underground’. But with ‘complex terrain conditions’, according to a government spokeswoman in Malaga, progress was slow. By early Friday afternoon, workers had dug 2.5 metres out of the four needed. The unprecedented rescue operation has been fraught with complications that have caused delay upon delay as Julen’s distraught parents and relatives stand by. Explosives experts and elite miners are just some of those taking part in the operation, with the hope Julen is still alive after all this time. Rescuers have not been able to get to Julen via the well he fell down because it is blocked by a layer of earth, sand and stones believed to have been dislodged when he tumbled into the shaft. They decided to dig a vertical shaft parallel to the well, 60 metres deep, which was finished late on Monday. The idea was to secure the shaft with tubes then take elite miners down in a specially made cage to start digging a horizontal tunnel to the site where they believe the child is. But the tubes designed to secure the shaft didn’t fit, so they had to widen it, which delayed the operation still further. Eventually, they succeeded and the miners are now busy digging the horizontal tunnel, taking turns in teams of two.